At the end of September, some 30,000 people visited London’s ExCel to get a sneak peek into the future. With talks and exhibitions on everything from the practicalities of moving to Mars to the prospects of using DNA for data storage, New Scientist Live set out to challenge, puzzle and entertain its audience in equal measure. This show, now in its second year, is just one example of the plethora of interactive science and engineering engagement opportunities available. The show brought some of the UK’s best-known engineering companies together under one roof. 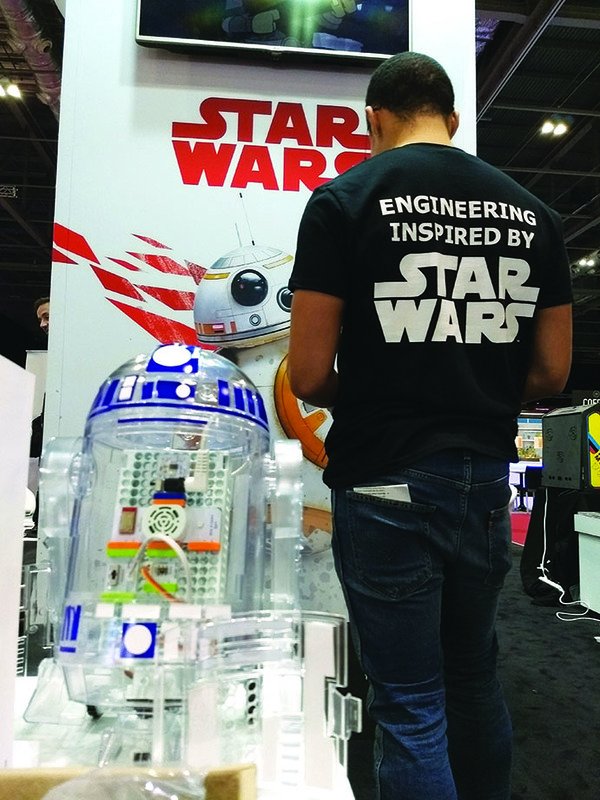 The Royal Academy of Engineering presented a special exhibition of engineering inspired by Star Wars, showcasing how engineering innovation is bringing real-life research ever closer to the world portrayed in the films. Prof Sriram Subramanian and his team from the Interact Lab at the University of Sussex showed visitors how levitation is possible using a cushion of ultrasound. They also demonstrated haptics, the ultrasound-based technology that allows people to ‘feel’ invisible objects and is already revolutionising the way that surgeons and dentists are trained, as well as adding sensory feedback to glass touchscreens. The UK’s museums have significantly raised the bar in recent years on public engagement – including with engineering. The Victoria & Albert Museum’s popular exhibition on the life of Ove Arup and the Science Museum’s engagement with national opportunities through live broadcasts such as Tim Peake’s mission launch demonstrate the growing market for public engagement with science, engineering, technology and mathematics. The academy runs a public engagement programme, Ingenious, to support projects across the UK that engage the public with engineers and engineering. To date, Ingenious has provided opportunities for more than 5,000 engineers to gain skills in communication and bring engineering to the heart of society. It is encouraging to see both the rising numbers of high-quality applications to the scheme, and the high proportion of participating engineers that continue to undertake engagement post-project. Why is this increasing level of STEM engagement happening? Much of the current public engagement aims to attract more young people into STEM careers, driven by the recognised skills shortages and gaps across STEM, and in engineering in particular. We also know from the engineers who participate in Ingenious that they find public engagement rewarding, not least because it helps remind them what they love about their jobs. At the last count, there were well over 600 initiatives focused on STEM engagement in schools. Having so many initiatives may actually be part of the problem; we need to take a much more cohesive approach if we are to have the impact we’re seeking. The government’s Year of Engineering 2018 seeks to do that. Government has recognised the skills shortage, not least because developing a successful industrial strategy depends critically on the availability of a highly skilled workforce for the future, and has invested in a programme to give more than a million young people parents and teachers direct and inspiring experiences of engineering over the course of the year. The Year of Engineering aims to build on a multitude of national and regional initiatives that already promote engineering as a career choice, including EngineeringUK’s hugely popular Big Bang Fair, which brings more than 80,000 students to the NEC every year to celebrate engineering, and the annual Tomorrow’s Engineers Week. As an active partner in the Year, the Academy will be running This is Engineering, a novel multi-year marketing communications campaign aimed at rebranding engineering for young people aged 13-18 and their teachers and parents, to change their perceptions of engineering and encourage more young people from all backgrounds to consider careers in engineering. It seeks to pool resources to deliver a more visible, more powerful and more unifying campaign than anything that has gone before, and provide digital content that all engineering organisations can use to attract the next generation of talent. Together, the Year of Engineering 2018 and This is Engineering will give our audiences multiple opportunities to experience positive and unified messages about engineering, improving their awareness and attitudes and encouraging them to find out more about engineering careers, via the Tomorrow’s Engineers website. This is Engineering aims to provide a legacy for the Year of Engineering well beyond 2018, building on what’s worked and nurturing its community of advocates and supporters. Encouraging more young people from all backgrounds to pursue engineering requires long-term action, and a coordinated effort across the whole profession.